Last August, two petitions were sent to the National Marine Fisheries Service from three conservation organizations (the Animal Welfare Institute, WildEarth Guardians and Friends of Animals). The petitions (available in their entirety here) requested that four species of skate be listed as “threatened” or “endangered” under the Endangered Species Act, and requested that critical habitat for these species be designated and appropriately protected. 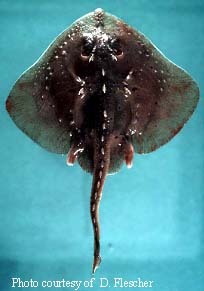 These species are the thorny skate, barndoor skate, winter skate, and smooth skate. Due to both a directed fishery (skate wings are used for lobster trap bait, and also for food for a primarily-overseas market that includes Europe) and bycatch in bottom fisheries , Northwest Atlantic populations of these species have experienced serious declines in recent years. While some skate species have rebounded (for reasons that are not entirely clear), The thorny skate remains particularly threatened- the IUCN Red List considers the subpopulation off the Northeastern U.S. coast to be Critically Endangered. It is illegal for U.S. fishermen to keep thorny skates they catch (and has been since 2004), but they are commonly taken as bycatch in fisheries for the other skates and groundfish. The National Marine Fisheries Service listed several reasons why they believe these skates should not be listed under the Endangered Species Act.